When Paul Bewsher arrived at the Handley Page aerodrome he was, as he writes in this atmospheric book, "to have the good fortune to be attached to a pioneering branch of the Air Service, and that, instead of going to a cut-and-dried task, I was to assist in operations which had been untried and were entirely experimental. "Now I was to be the first observer on the huge night bombers, which were to prove of such tremendous value. I found the squadron to be as a new born babe, blinking at the light of day. In a couple of vast green hangars slept two gigantic machines. The skeleton of a third hangar reared its wooden lattice-work against the deep August sky, and everywhere lay heaps of material and stores!" 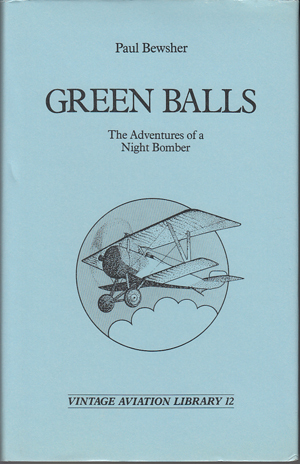 Green Balls is a lyrical, evocative descriptive account of an observer flying Handley Pages with the RNAS. Among the memorable raids in which Bewsher participated was one on a bridge over the River Meuse, the longest night flight on a target at that time, some 150 miles behind enemy lines, and a dramatic raid in April 1918 on Zeebrugge.